This is another recipe where I used the blueberries we picked at Fairgreen Farm. This recipe is like taking apart all the best parts of a berry crumble, and putting it back together better, fresher and much lighter. I served this at the end of a 3 course meal and it makes the perfect dessert for a dinner party as it can be prepared early, kept in the fridge and is nice and light after a heavy meal. If making early make sure you add the crumble topping just before serving so it stays crunchy. We enjoyed this topped with a cashew crème fraîche. 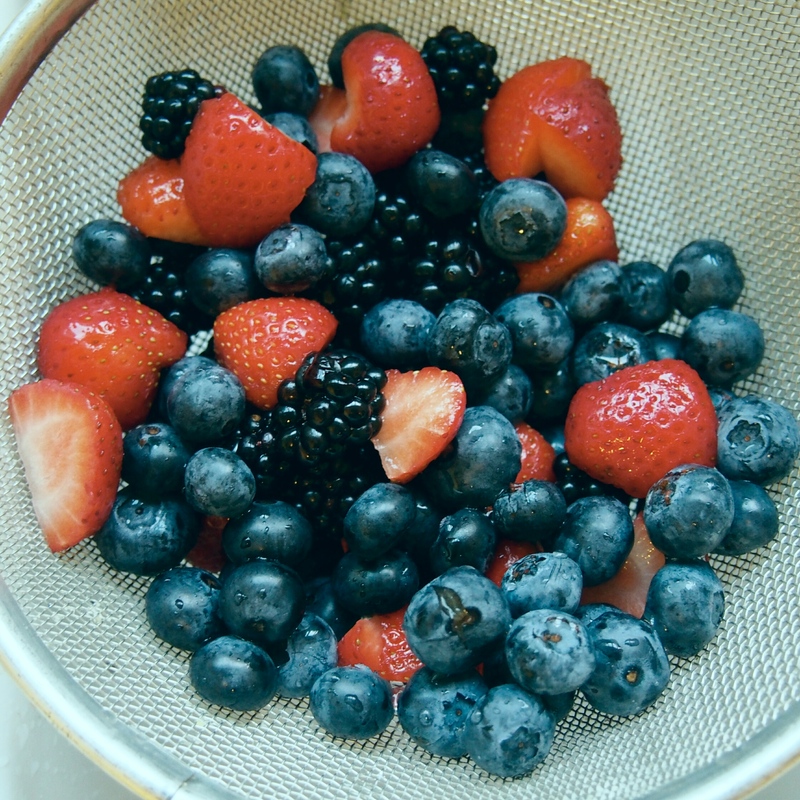 Mix the jam and lemon juice together in a bowl, then stir in the berries. 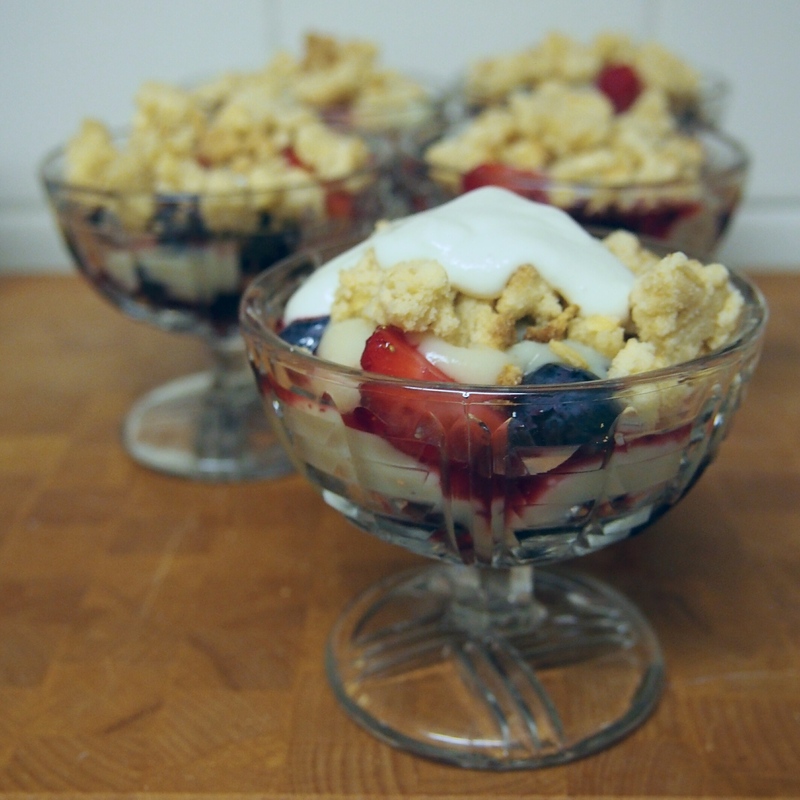 Spoon some of the berries in to either a glass serving dish, cup or ramekin, then add a layer of custard, then another layer of berries, more custard then sprinkle with the cooled crumble topping. Heat the milk in a saucepan, do not boil. Using a handheld or electric whisk mix together the cornstarch, plain flour, sugar, water and salt until slightly bubbly in a mixing bowl. Once the milk is hot, transfer half of it into the bowl with the cornstarch mixture and whisk until well combined, then pour back the saucepan. Keep whisking and gently bring to the boil. Let mixture thicken and bubble to 2 minutes, keep whisking. Taste to make sure the custard is smooth and the flour has cooked properly. If custard has a floury taste keep simmering a minute or two more. Remove from heat and stir in vanilla and leave custard to cool. Before serving whisk custard well to remove any lumps. Mix all ingredients up in a bowl and rub together with your fingers until well mixed. Crumble out mixture over a glass baking dish, leaving some chunks, and bake for 12 minutes at 180°c until golden.